Aid Watch Palestine holds parallel exhibitions in the West Bank and Gaza to advocate for a just reconstruction process in the besieged coastal enclave, and assert Palestinian unity. 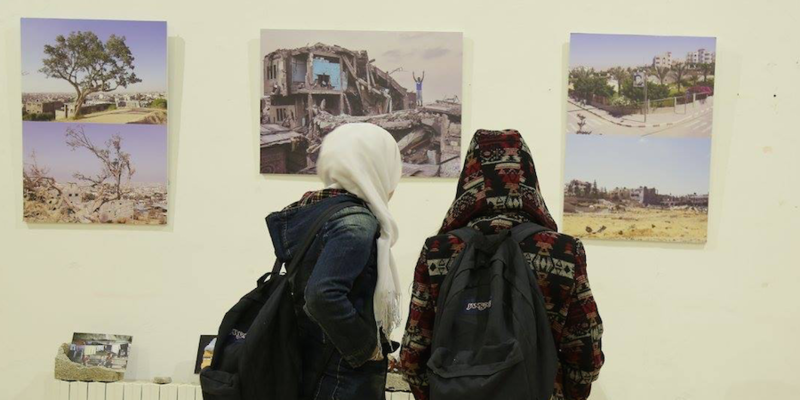 On Wednesday, November 23, Aid Watch Palestine (AIP) organized a photo exhibition in central Ramallah, West Bank, titled “Gaza Incomplete.” The event addressed reconstruction efforts in Gaza since the 51-day Israeli offensive against the besieged coastal enclave in the summer of 2014. AIP is an independent Palestinian civil society initiative that stimulates and supports efforts to make international aid more accountable to Palestinians — starting with reconstruction of the Gaza Strip. The exhibition sought to raise awareness, in the West Bank, of the severity of Gaza’s on-going humanitarian crisis since the offensive, as well as the reasons why international aid has not been successful in meaningfully slowing it. AIP hopes that doing so will change public opinion and eventually push the Palestinian and Israeli governments to change their respective – and sometimes coordinated – policies on Gaza. The event consisted of two short films and a photo exhibition. The 2014 Israeli offensive on Gaza exacted unprecedented devastation. Israeli forces killed 2,251 Palestinians and completely destroyed 18,000 houses. It was estimated that an adequate reconstruction effort would cost $570 million and require 4 million tons of materials. Photos displayed as a part of “Gaza Incomplete.” Photo by Louisa Emslie. In response to the 2014 Israeli offensive, the United Nations Office for the Coordination of Humanitarian Affairs (OCHA) in Palestine requested a total of $570 million for reconstruction efforts. International donors then pledged millions of dollars to rehabilitate Gaza’s infrastructure. However, as of November 2016, only $195 million has been disbursed. In other words, only 34% of the total budget requested for urgent humanitarian needs was met two yeas after the offensive. The lack of funds continues to contribute to the suffering of an entire population, leaving the 28% of Gazans who were displaced with bleak prospects of returning home. A film shown by AIP at the exhibition stated that 4,000 homes were still unrepaired from – not the 2014 offensive on Gaza – but the 2008 and 2012 Israeli attacks. But, even if Gaza were to receive an appropriate amount of humanitarian aid to piece together the damage incurred in 2014, other obstacles persist. “We want to raise awareness not only about the suffering of people in Gaza, but also about the [Gaza Reconstruction Mechanism (GRM)] and its implications,” Ghobia added. The GRM is a temporary agreement brokered by the United Nations (UN) between the Palestinian Authority (PA) and Israel that intends to address conflicting interests: Israel’s security concerns and the entry of essential construction materials into Gaza in light of Israel’s decade-long blockade on the coastal enclave. The GRM dictates that the UN monitors and collects private information about Palestinian households in a database accessible to Israel. Israel then retains the power to veto which Gazan families are given permission to sell and receive building materials. As pointed out in an AIP film at “Gaza Incomplete,” the GRM has not fulfilled its self-professed raison d’etre: only 16% of such materials have entered Gaza thus far. Because of the paltry entry of goods, critics see the GRM as another treaty that legitimizes and reinforces the Israeli blockade whilst undermining the livelihoods of the people of Gaza due to the imposition of a strict monitoring system that only seems to further restrict the flow of goods. Moreover, 65% of purchased construction materials that do enter Gaza come from Israeli markets, thus financially propping up the Israeli economy. Photos displayed as a part of “Gaza Incomplete.” Photo by Palestine Aid Watch. Until then AIP will continue to encourage discussion of why international aid has failed to alleviate the affects of Israeli occupation in Gaza in such a way that both advocates for Gazans’ needs and insists upon the unity of Palestine. In Gaza, AIP held “Gaza Incomplete” with a different aim: to initiate dialogue between the Gazan people and authorities leading reconstruction efforts, and create space for those affected to voice concerns. Louisa Emslie is a graduate from the University of Edinburgh where she studied Arabic and Spanish Studies. She lives and works in Ramallah, Palestine.